After I decided that the animation was a bit of a no go for me... it was decided that I could still keep the character but apply him to a more commercial application.. in this case.. an editorial. It's not exactly a current topic of conversation but the whole country is going "Green" mad, as we all now recycle, buy recycled products, try to buy more organic and locally sourced produce etc... so as the last stocks of incandescent bulbs hit the shelves, people are rushing to stock up on them before having to replace them with their more energy efficient counter parts or replace their light fittings altogether. I started coming up with some way of showing this challenge between my incandescent bulb character and a energy efficient one through the use of metaphors.. either in a race or another face off of some sort. I'd already created some characters out of various bulbs but some of the ideas didnt jump off of the page at me... im used to creating some sort of character but trying to create a scene to populate with my characters throws me as I over complicate things. Anyway, I liked the idea of having my heart filled and optimistic character showing that he'd never give up... thus... this came about.. I can't remember what extra information I was going to add to this post, but basically I feel somewhat hard done by on this particular brief... I received quite a low mark on it yet I was rather impressed with what I produced. I know this had originally started as a project for D&AD.. i was meant to create a small animation. but i'm not an animator so rather than waste time learning how to bring my character to life... it was decided that rather than pursue this track I could take the character and add him into an editorial context... i think what my tutors didnt like was the fact that I only produced 1 editorial image... (and 1 mediocre attempt at a retro inspired poster).. but did all the development of the character and storyboarding for the animation not count for that much? from a visual standpoint this is just brilliant, its got the top notch professional look about it. so confident and bold, theres no student whos unsure in this image. 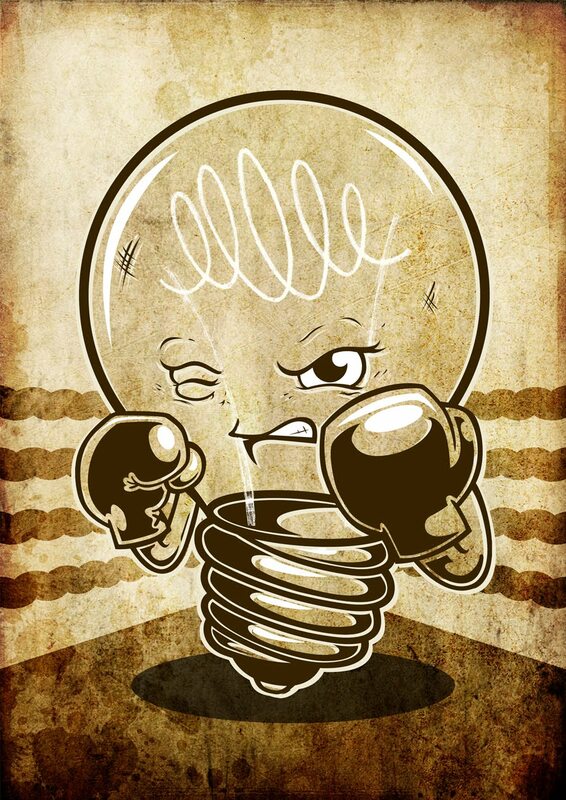 as an illustration its quite smart, the bulb is going down fighting. i like it.